In a large stockpot, add the chicken pieces, onion, carrots, garlic cloves and dill and cover it with about 4 quarts of water. Bring to a boil, reduce heat, and simmer removing the foam off the top periodically. Take the breast pieces out after about 15 minutes. Cook the rest on a simmer for 2 hours. Cool the broth off and take the chicken pieces out. Shred the breast pieces including the rest and keep aside to add to the soup right before serving. Strain the broth and smash all the vegetables with the back of a ladle and strain as well. Taste the broth and add salt if needed. 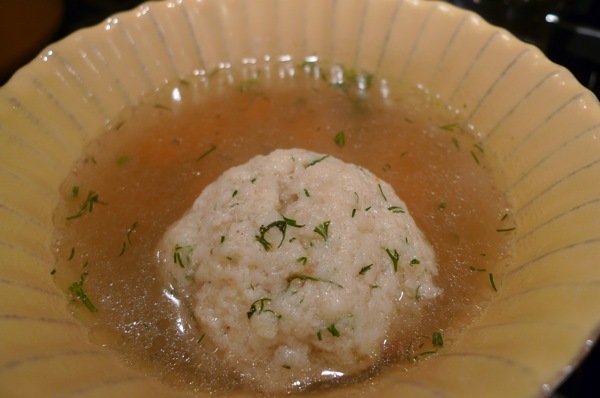 Mix the shallot, garlic and dill into the matzoh ball mix and cook according to the directions. Bring the broth to a boil and add the carrots and chicken. Add the cooked matzoh balls to the broth and taste for seasonings. Add the dill right before serving.